This is my Favorite Stamping Bella............Cosmobella!! Isn't she just the cutest?? I love paperpiecing her outfit, it's so much fun! You can't tell from the picture - but I used my Stardust pen to add polkadots to her shirt - definite bling IRL! 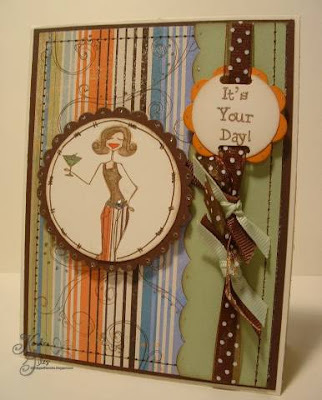 The DP is Tres Jolie and I used my Doodle This stampset to add a little something to the background. Yes, I know - I cannot put down my corner rounder and stop making scalloped edges!! I really try, but I always reach for it lol I didn't make this card for anybody in particular, just to have in my stash - you can never have enough of those. I opened up my email this morning to find an amazing short letter from this lovely lady from one of the stamping magazines that we all adore! At first I wasn't sure what I was getting an email for, but then quickly realized she was asking/inviting me to submit some of my cards for publication. She said she is an avid reader/fan of my blog. WOW - me! I know a lot of you girls out there submit your work often, but it really hadn't crossed my mind until now to do the same. *big grin* I guess I will get some of my work together and see what happens! Accessories: Paper Piercer, Dimensionals, Mega Scallop Circle Punch, Circle Punches, Cuttlebug Flower diecut, gemstones, Prismacolor Pencils, Stardust Pen and ribbon. 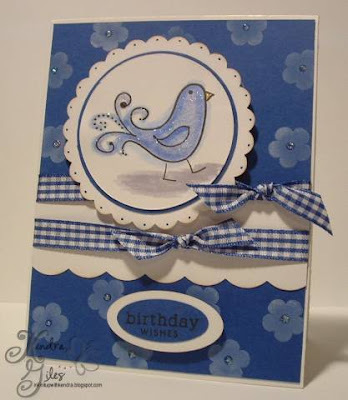 The very first time that I saw this Rhonna Farrer bird I fell in love with it - I think it's just adorable. I looked everywhere for one, but to no avail! Then low and behold I won this little beauty from Sara Moore's blog! woohoo!! 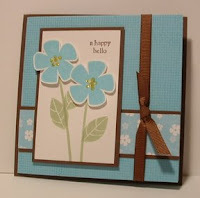 This was my card for my stamp club swap this month - I whipped these out in no time at all. I colored the image using a paintbrush, water and my inkpads - supah simple! I added a little sparkle to my bird and the center of the flowers using stickles. This is the card I designed for my stamp club this weekend. I decided to use the SU! Polka Dots and Petals and Circle of Friendship. Both of these sets are a blast to play with - you can do so much with them. 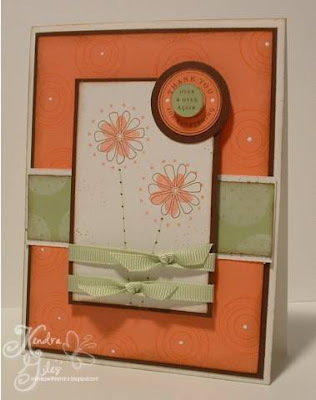 I used Cameo Coral, Certainly Celery and Chocolate Chip together - what a great color combo! Wow, I had been missing playing with my SU! stamps - they have some of my most favorite stamps!! Oh gee how I love my paper piercer too - I pretty much try to use it on all of my cards in one way or another! *wink* I am really bummed that SU! started selling their grosgrain ribbon in 15 yard spools instead of 25 yard spools!!! I LOVE my grosgrain ribbon and use it all the time!!! I also can't believe that you can't get chocolate chip grosgrain in the 1/4" anymore - what the heck is up with that? I use a ton of that! *boohoo* okay, well enough of my ranting and raving. I hope you all had a fabulous weekend - I am now counting the days until my vacation (only 2 weeks away). I am not going anywhere this year - just relaxing! My friend's birthday is coming up and I decided to make her a special birthday card using my new It's Your Birthday stampset from My Favorite Things. I love, love, love to use the Tulip Puffy Paint for the icing - makes it look realistic! 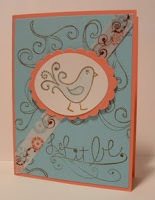 I used the Faux Ribbon Set from Papertrey Ink for the backgrounder. The layout inspiration is from SC126 on SCS - I FINALLY decided to try one of the sketch challenges. 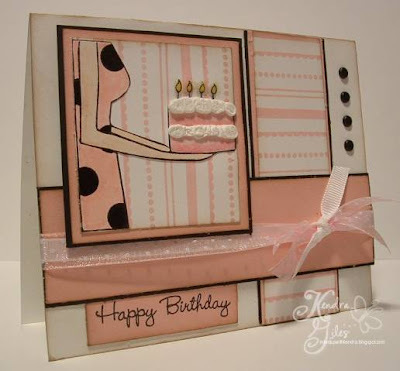 I think the card turned out great and I love pink and black together! Check back soon as some of my new Hambo Stamps have arrived and I will also be posting some Blogger RAK's I have received (yes I know I am behind in posting those lol). Have a safe and Happy 4th of July!